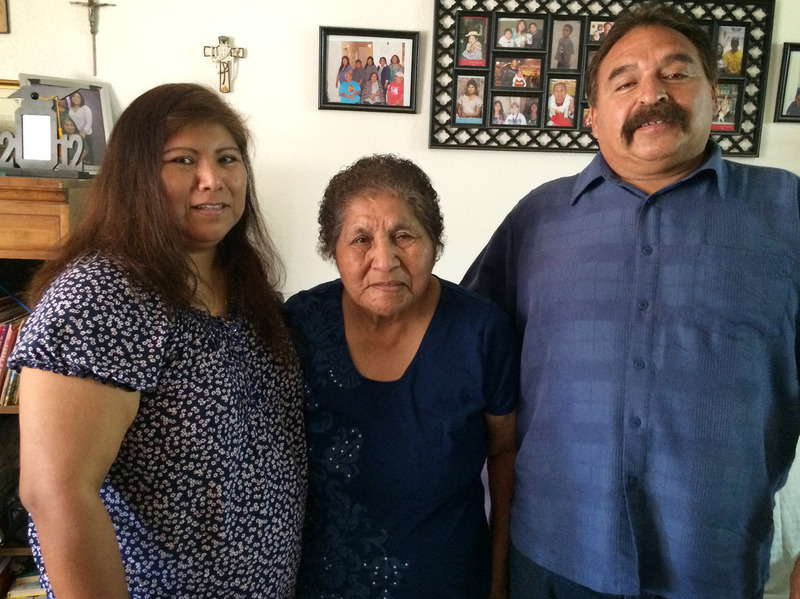 Delma and Antonio Salazar have been caring for Delma's mother, Agnes Williams (middle), who has severe memory problems, for the past seven years. About 5.3 million Americans have Alzheimer's disease, the latest statistics suggest, and it's probably about as common on Native American reservations as anywhere else. But a diagnosis in Indian Country is rarer, say mental health workers. That's likely at least partly because of a cultural belief — many Native American communities don't recognize dementia as a disorder. "In fact, many tribal communities do not have a word for dementia," says Dr. Anna Burke, a geriatric psychiatrist and specialist in dementia care at Banner Alzheimer's Institute, in Phoenix, which runs an outreach program to Native American communities in the Southwest and beyond. "They simply see aging and this more childlike behavior as the circle of life closing in on itself," Burke says. People begin life as children, and leave as children. But that acceptance can leave many families feeling isolated, and less likely to reach for support and resources that could help. Delma Salazar, her husband and three children were living in Los Angeles eight years ago when her sister called about their mother, Agnes Williams, who had lived her whole life in the Salt River Pima-Maricopa Indian Community, southeast of Phoenix, in rural Arizona. Their mother kept forgetting things and getting lost, the sister said. "I didn't know what Alzheimer's was," Salazar says. "Nobody's ever talked about it. Maybe it's an embarrassment." As the memory problems grew worse, Salazar brought her mother to live with her family in Los Angeles. But Williams had never been outside her community. In Southern California, she kept running away and forgetting where she was. "It was one night — I was sleeping in the living room, and I remember waking up and watching her walk into the kitchen," Salazar said. "And she just looked up, she looked around and she was wondering where she was." That's the scariest part of the illness, Salazar says. "I realized — she really doesn't know." In her rare moments of clarity, Williams would say she was desperate to go home. So eventually the family moved with her, back to the reservation. Williams has 14 children, many of whom live in the area. But Salazar says she is the only one caring for her mother. "I don't know if they are scared to see her like that," Salazar says. "I know they say they have their own family now. It hurts that nobody visits." Salazar says she feels guilty, too, that she initially doubted her mother, when the older woman said she couldn't remember things. Nicole Lomay, who travels to the Arizona tribes as community outreach representative for the Banner institute, says Salazar's story is very common. "The people come to me," Lomay says, "and tell me, 'I didn't know! I didn't know that my wife is having symptoms of Alzheimer's disease — and I was giving my wife a hard time. I thought she was just getting on my nerves. I thought she was doing it on purpose.' "
Lomay, who is Navajo, has a grandfather with dementia. "He was herding sheep in his truck," Lomay recalls. "So, they were allowing him to drive to the location where these animals are. With my own family — they didn't have the resources, at all." The Banner institute holds workshops for health care providers and social workers, teaching them how to do memory screenings, talk to families and lead support groups. Salazar says she doesn't have time to go to support group meetings, but having an understanding of the disease does help. She has learned to cherish the rare moments when her mother wakes up and laughs or shows a glimmer of her old self. "We've always been close," Salazar says. "So to see her be that strong, Native woman — always cooking, always cleaning, trying to plant her own garden — that was a whole different picture compared to now, and it's hard." Her mother's Alzheimer's has progressed beyond the beginning stages. She has to be led to the kitchen to eat and to her bed to sleep. Often, she reverts to her Native language — Akimel O'odham — but her daughter can't understand her. When I visit the family in their home, Salazar sits close to her mom in their living room. I ask Agnes Williams her age. "How old am I," Wiliams repeats. "Yes. I don't even know. Eighty-nine. Eighty-nine, I guess." Williams looks for a minute as though she's trying to complete a puzzle, then gives up and falls asleep. Salazar gently reaches over and covers her mother with a fuzzy purple blanket. This story was produced by KJZZ's Fronteras: The Changing America Desk.